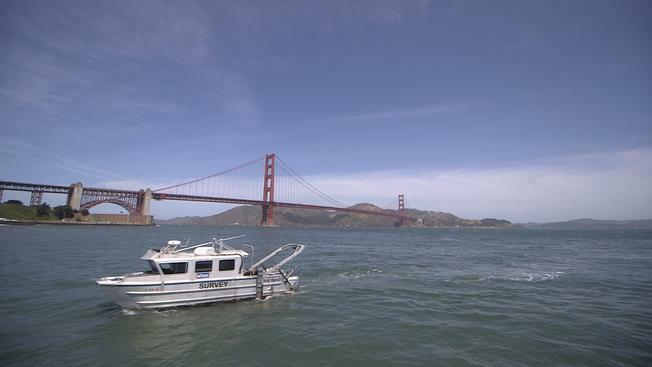 A small boat outfitted with all sorts of strange contraptions began trolling back and forth along Torpedo Wharf, just a few hundred yards south of the Golden Gate Bridge in the San Francisco Bay. The throngs of fishermen casting their lines from the old wooden pier watched the boat warily — noting curiously that it didn’t actually possess anything resembling fishing gear — in the midst of striped bass season. But this boat wasn’t interested in what might be swimming through the churning waters of the bay. It was concerned with what lie on the sea floor. The ship was part of a project by the National Park Service to map the sea floor around the historic wharf, as the park service prepares to restore the old structure. “We’re looking for anything that may be of historic importance,” said Peter Gavette, an archaeologist with the National Park Service. Torpedo Wharf was built in 1942 and used by the Army to load torpedoes and mines stored in nearby buildings onto awaiting ships during World War II. The military also kept a string of underwater mines in the area to protect against potential invading ships. Gavette said one of the mines was lost and unaccounted for. With restoration work on the old wharf on the horizon, Gavette commissioned the company Etrac Inc. to survey the ocean floor with sonar, making sure there were no historic shipwrecks or military artifacts that could get disturbed. The Etrac Inc. boat made repeated passes around the wharf, as if meticulously painting a fence. David Neff of Etrac described the process of scanning the sea floor with sonar as “mowing the lawn.” Inside the boat, a computer monitor began to fill with 3D imaging showing the detailed features of the bay’s bottom. Gavette said the team had good reason to believe they’d find something significant. Since 1852, the mouth of the Golden Gate Strait has seen numerous shipwrecks, including the City of Chester, The Aberdeen and the Golden Fleece. Gavette also expected to see signs of the original wharf that sat beneath Torpedo Wharf. But as the boat’s high resolution mapping filled the screens, it wasn’t shipwrecks, old piers or military munitions that were revealed. Instead Gavette noted the darkened shape of a few tires. Neff pointed out a what appeared to be rocks. A long strip of dirt may have pointed to the site of the original pier. The one big surprise was indeed a lost vessel of sorts. Whether this particular cart lost its way on a dark and stormy night, or tumbled off the back of some billionaire’s yacht, is anyone’s guess. Yet here it was — an artifact indeed. And a strange one at that. The team next plans to scan the area with a magnetometer to see if anything metal turns up, such as a forgotten military ordinance. Gavette smiled sheepishly at the team’s unusual discovery — shaking off the absence of shipwrecks or other historic pieces revealed by the sonar. He glanced at the image of the golf cart, sitting stoically upright as if about to ferry its passenger to the 9th hole. “You never know what you’ll find when you look,” Gavette said.